Art Basel Miami has become the place to be the 1st week in December for avant-garde art collectors as well as car manufacturers. 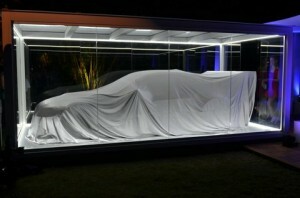 This year, BMW presented two special cars in two gorgeous venues. 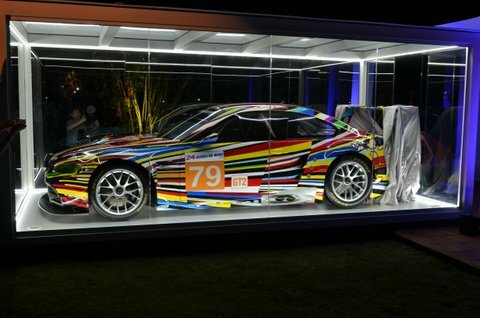 The U.S. introduction of BMW’s 17th Art Car. 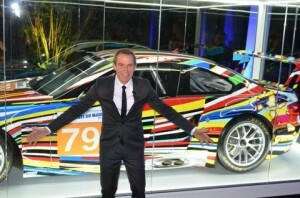 This particular car being a BMW M3 GT2 race-car done by artist Jeff Koons. This special M3 raced in the 2010 24 Hours of Le Mans race, sporting race #79, significant as it paid homage to the same number used on the 1st Art Car back in 1979, a BMW M1 painted by American Artist, Andy Warhol. Now, this colorful M3 racer will go on become the newest member of the collection together with other iconic BMW art cars. Arriving at the lush Miami Beach Botanical Gardens, it was like a welcome oasis, the evening was warm and clear and the setting was perfect. Off to the left was a rectangular box with lights all around, inside, the M3 covered in a grey silk drape. Miami’s glitterati, out in full force, enjoyed canapés and champagne at the event. 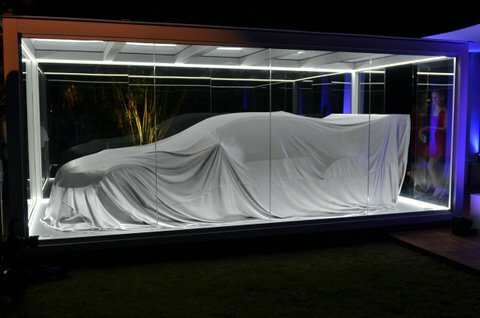 I n attendance were Mr. Jeff Koons and supermodel Karolína Kurková, who did a superb job pulling the silk drape in a dramatic fashion, bit by bit, giving everyone a wonderful, slow reveal of the stunning and newest BMW Art Car. The color is dramatic, and fits the outgoing M3 shape perfectly. Of course, being a race car this particular coupe had a dramatic aerodynamic wing in the rear as well as huge wheels and tires. Without a doubt, Mr Koons’ creation was an instant hit with the crowd. 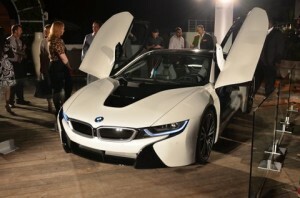 The following evening it was off to the swanky SLS Hotel on South Beach for the BMW i8 party. Arriving into the simple porte-cochère of the hotel, BMW’s presence was instantly felt as several cars, namely the all-new i3 electric car as well as a sporty Alpina B7 where on prominent display. The Hotel is spectacular, with wall-to-wall beautiful people lounging around its public areas and dramatic wall art, this was a wonderful place to people watch. I spent a few minutes taking in the atmosphere, but soon I realized I was here for a different reason all together, so it was off to the hotel’s elegant pool deck where BMW set up a special VIP roped off area was specifically for the i8 event. Once past the velvet rope, the champagne and hors d’oeuvres flowed all evening. Once again, Karolína Kurková was there to pose for photos and mingle with the guests, but the star of the evening was the BMW i8. I had only seen the newest BMW offering in photos and video, and this was my 1st time seeing it live. What was my 1st impression of the i8 super-car? Impressive! Frankly, photos do not do the i8 justice; the dramatic forward opening doors and the modern-looking rear caught my eye the most. 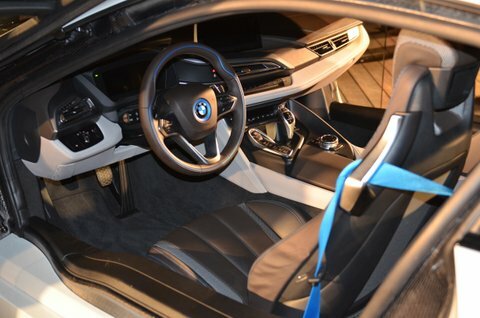 Unfortunately, sitting in the car was verboten, although I did get a chance to look at the interior in detail and I was pleasantly surprised to see how BMW is evolving in their interior designs.